The Rollerblade Maxxum 90 Urban Inline Skates combine a fusion of superior lateral support, comfortable padded liners, and a versatile wheel setup that can be used for commuting, cruising, or training. The vented, molded hard shell provides plenty of support, paired with Specialized Fit liners that ensure comfort for all activities. Wearing The Rollerblade Maxxum 90 Urban Inline Skates, they provide secure comfort and performance that allows you to challenge your skate. The extruded aluminum frame can fit up to 90mm wheels and enables excellent power transfer and stability. These skates come with the new Rollerblade Hydrogen Wheels that enhance your rolling experience and produce good speed with the Rollerblade SG9 Bearings. Good Skates, Bad Closure System. Very honest and helpful review. Q: I am 5'3” and wear a size 7 in women's. Will the boot of this skate be too larger? A: This skate would work but I'd personally recommend taking a look at the women's Maxxum 84 or Maxxum 90 skates from Rollerblade. The women's versions offer a women's specific fit being slightly narrower and offering a lower cuff in the back to offer more comfort for a woman's lower calf muscle. Some women with a wider foot opt for a men's skate but if you don't have a wider foot I'd stick with a women's specific model. A: Weighed the size 9.5 in the skate box, 10.35lbs. The shipping box and materials will add just a slight more weight. Q: Do they have hydrogen wheels? Q: Are they shock absorbent? A: Yes, there is a heel shock absorber in the skate. It can be seen in the picture, it's the red portion on the heel of the skate. 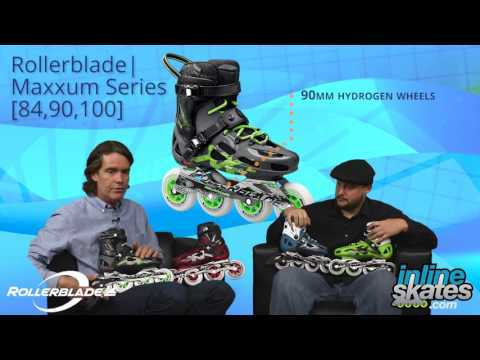 Q: Can these Maxxum 90 Inline Skates be used as Freeskates / Freestyle also? I want to eventually use these to Freeskate / Freestyle. The materials seem premium and has a hard shell. I don't mind if the wheels are 90mm or if the skates are not low center of gravity, I just want to know if these can handle freeskate style? A: I skate with these and the Twister 110 3WD and I'd recommend the Twister 110 more for freestyle even though it has a larger wheel the 3 wheel design gives you utter control over your skates without sacrificing the speed thanks to the larger wheels. The elongated frame on the Maxxum 90 is great for speed but you lose some of the control you're going to want with freestyle skating. I'd highly recommend checking out a 3WD design skate, I absolutely love the control I get with the 3WD 110mm design. Q: I f I am rollerblading on hot cement and asphalt, since I live in Arizona, are the tires going to wear down faster? And if so, should I rotate the tires more often? A: Yeah, the wheels are going to wear a bit faster on hot surfaces I'd assume and you may want to rotate more often, just keep an eye on the wheels and rotate when you feel necessary. There are many factors that go into how fast wheels wear including user weight, how hard you push while skating, the actual surfaces in both texture and temperature. It's good to take stock after each skate or couple skates and keep an eye on the wheels. A: Yes, an 84mm wheel will fit on these skates. The frame can only take up to a 90mm wheel. Q: I'm going to purchase a pair of inline skates to dryland train for skiing. Trying to decide between the Maxxum and the Macroblade (I have a D width foot). I would also be open to suggestions regarding other skates. I'm an advanced skier and played lots of hockey as a kid. A: I own the Maxxum 90 skates and they are great for intensive training, think hard and fast skating, but are not ideal in my opinion for distance skating. The boot in the Maxxum lends itself well to extreme support and durability but in that you lose a bit of the comfort necessary for longer excursions. I am looking into purchasing this season's new Macroblade 3WD myself for longer distance skating, the Macroblade boot is going to be a bit more forgiving but will still offer the support necessary. So it really depends on the skating that you are doing, there is merit in owning both pairs if you have the means, but if I had to choose just one for overall skating It'd be the comfort of the Macroblade. Q: Is this skate made for women or is this a unisex skate. I wear a true 6.5 women's shoe. A: This skate is sized in men's sizing, so you'd want to drop a full size to accommodate the difference. 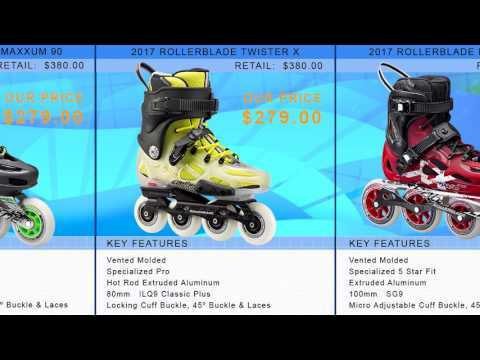 There is a women's version with 84mm wheels instead of 90mm wheels, the Rollerblade Maxxum 84 Womens would be a great choice as well if you're OK with going down to an 84mm wheel instead of 90, the women's specific fit is going to be a bit lower cuffed for a woman's calf muscle and will offer a slightly narrower fit for a woman's foot shape. Q: I have a wide foot. Would these be okay or can you recommend a different model?